Let’s talk bathrooms today. With our bungalow-to-3-story-home renovation/addition currently underway, we are going from having 1 pretty teeny bathroom (remember how we renovated it a few years ago here?) to 3. Talk about luxury! We are leaving our master bathroom to finish until after we have moved in, as we will not need it right away. That way we can wait for good sales and do some of the finishing ourselves. The other bathroom on the second floor though – the one designated for kids and guests – is on the more immediate “must finish” list so that we have a functioning bathroom on the second floor. 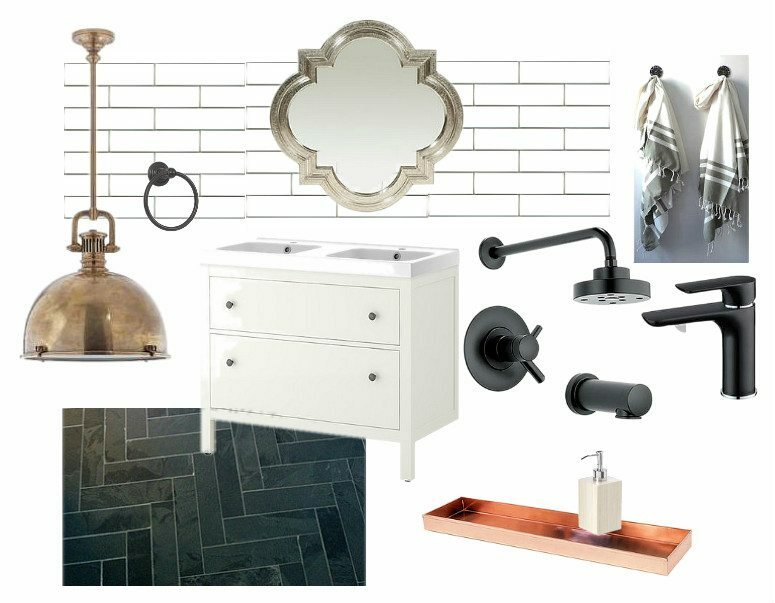 Keep reading for the scoop on how we laid herringbone tile floors and used IKEA vanities to get a luxe look on a budget. I have tried to stay true to the moodboard, but a few things have changed along the way due to budget (isn’t that always the case?). Let’s start with the floor. This was undoubtedly going to be the highlight of the room for me. I wanted herringbone dark grey floors – non negotiable. I started my hunt for tile. The larger hardware stores don’t carry much in the long rectangular shape that really lends well to herringbone. 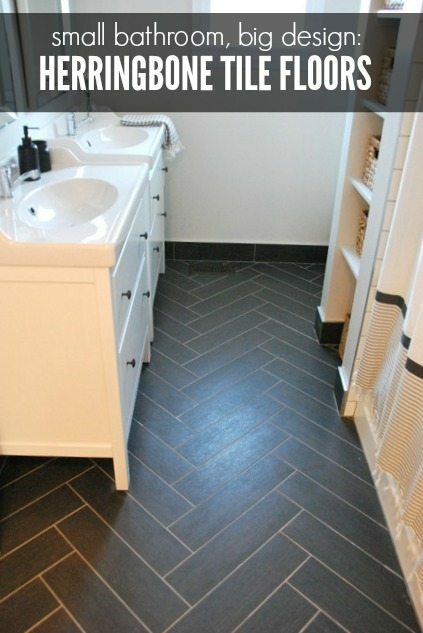 Tiles tend to be 12×12 (square), 12×24, 12×36 – which just aren’t skinny and long enough for a good herringbone in this room. So, I started to go to some of the specialty tile shops in the city. Man, I was like a kid in the candy store, guys. I was actually a bit surprised to find pretty decent prices. I had been thinking that it was going to be much more expensive to go the tile shop route, but many had a good variety in prices and options. In the end, I found the perfect tile. 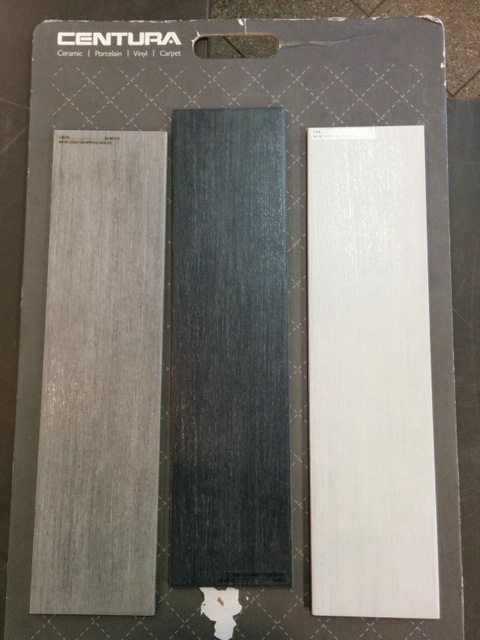 It is a 5×20 ceramic tile (from Centura Tile, for the local folks) in dark grey. It ran me $4.60 a square foot, which isn’t an insane deal or anything, but is still quite reasonably priced. We decided not to try DIYing any of the tile work in this room for a few reasons. Firstly – we needed it to happen fast. Since we aren’t living in the reno zone, finding time to go over there and actually work on the house, in between working jobs, parenthood, managing the rest of the reno, and other responsibilities, has been tricky. And secondly – it’s herringbone. That is tricky stuff! 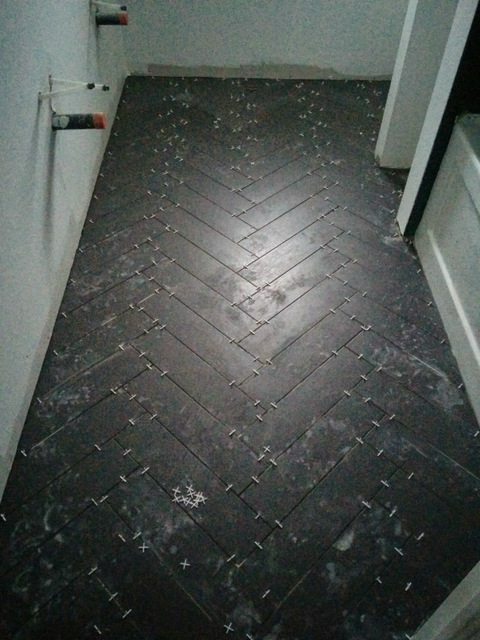 We have an amazing tile guy who does a perfect job…. so we were more than happy to pay him to lay all the tile for us. He busted out the herringbone floor in a day. NBD. Next up was the vanity. It’s not like we have an unlimited budget or anything, so I knew we needed to be cost conscious when choosing the vanity in here. Our priority was to have two sinks, but it could have been a single long vanity with two sinks or two separate vanities – I wasn’t picky. I looked around at the big hardware stores and online, but I kept coming back to IKEA. There just wasn’t much that could compare to their great prices and contemporary style. When I went into the store and actually took a closer look at the Hemnes vanity, which was the one I had featured in my original moodboard, I knew it was perfect. I liked the white finish, the rounded edges on the sink top, the lip at the back, the legs, soft close drawers, and even the dark knobs. They have a pretty classic shape and look. Luckily they come in a few different sizes, so we were able to fit two next to each other instead of one long one (more drawer space! more elbow room!). 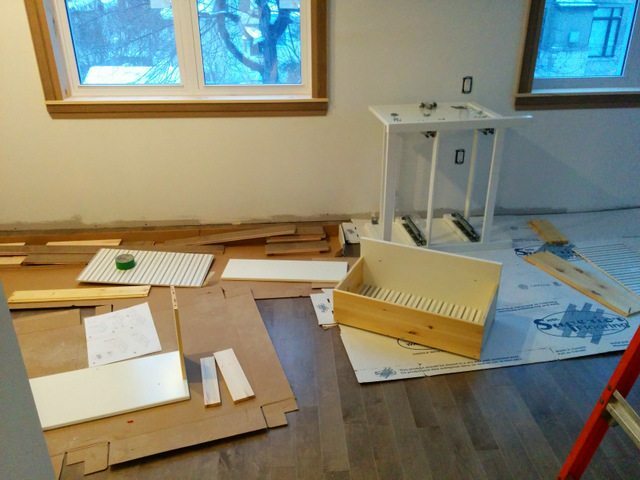 As is the case with IKEA stuff, there is a bit of a production zone putting the pieces all together. 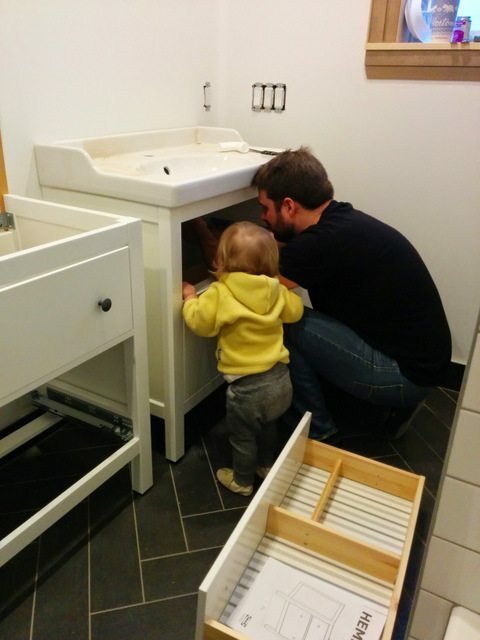 Dan had his trusty assistant helping him install the vanities. She was so funny picking up pieces of tube and sticking them up through the drain hole. Really trying to help Dad. I think I see a future renovator… ?? Oh, and see how the drawers come lined in that stripe paper? I thought that was a super nice touch. Well played, IKEA. Alright, that’s it for today. Gotta get over to the house and unpack Maya’s room. I have a whole car full of little girl clothes and toys waiting for me. Who knew she had SO MUCH STUFF. But this bathroom is coming together in lightning speed so I’ll be back soon with the rest of the progress! Hope you guys are having a great week! Update: See more bathroom progress in this post about our shower tile, and this one about getting the perfect gray paint and accessorizing. Thanks Catherine! I’m really pleased with how they came out. Fun that you have so many rooms on your to-renovate list!! The other tile place to check out in town is Euro Tile. Their selection is HUGE and the prices are really pretty good. Excellent sale room. Thanks for the tip.. will check them out too! Actually, the entire house needs major renovations/updates…plus we have a whole unfinished basement..and a yard with zero landscaping… so projects for a few years to come! hehe! love this look! what color grout did you use for the floor and shower?